On top of the features and release date news for Madden 19, EA Sports has released the timeline of reveals for its latest NFL release. 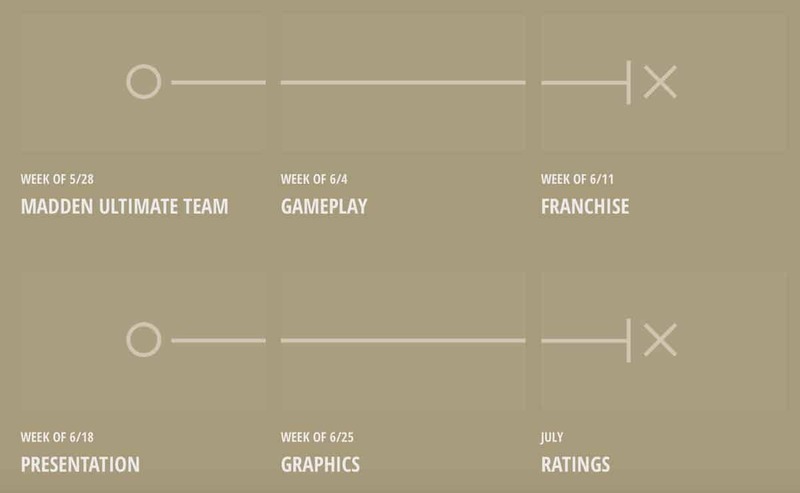 The first full look comes quickly during the week of May 28 when the Madden Ultimate Team deep dive takes place. The week of June 4 focuses on gameplay and the newly enhanced control schemes. Connected franchise will take center stage on June 11 where new features like draft class creator and player archetypes are expected to be discussed. June 18 is all about the game’s presentation while June 25th details the improved graphics in year two of the Frostbite Engine for Madden NFL. Lastly, the player ratings will start to be revealed in July, and go through the game’s release on August 10. What are you excited to see from Madden 19? Let us know in the comment section below, and be sure to stick with Sports Gamers Online for more Madden 19!